India is rich in minerals. According to the Geological Survey of India (GSI), out of the 31.4 lakh sq km of our country’s mappable area, about 5.71 lakh sq km has been identified for scheduled mining of the non-fuel and non-coal major minerals. 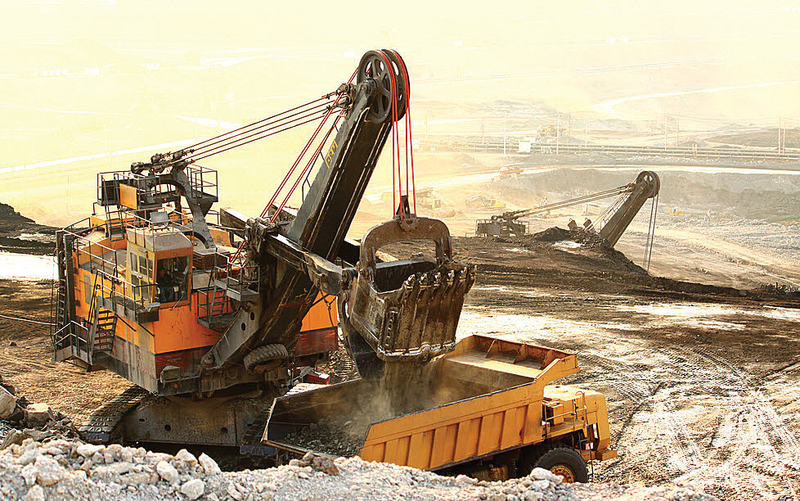 At present about 4,550 sq km has been leased for mining across India which excludes fuel, atomic or minor minerals. *The government will offer the pre-competitive baseline geo-scientific data of the highest standards in the public domain free of charge. *The government will conduct aero-geophysical survey of India in a mission mode. Initially, it will cover 8 lakh sq km of ‘potential’ areas, and then, move on to cover rest of the areas. *All the baseline and mineral exploration information collected by various central and state agencies, and mineral concession holders will be collated in a digital geospatial database which will be known as the National Geoscientific Data Repository (NGDR). *With an aim to find and unearth concealed and deep-seated mineral deposits, the government will establish a National Centre for Mineral Targeting (NCMT), which will work in collaboration with academia, industry and other geo-scientific organizations. *The government will auction identified exploration blocks to the private sector. If the exploration leads to auctionable resources, they will be offered a suitable revenue sharing model. Otherwise, the explorative expenditure will be reimbursed on a normative cut basis. The MMDR Amendment Act, 2015 specifies that the mineral concessions for major minerals will be granted through auction or competitive bidding. It also states that the mines will be granted for a fixed tenure and will be made easily transferable; strict penalty provisions will be introduced to stop illegal mining; and a National Mineral Exploration Trust (NMET) will be established to conduct detailed exploration on a regional basis. The Ministry of Mines, Power, Coal, and New & Renewable Energy also said that the State Governments will now grant mineral concessions, where atomic miners are less than the prescribed threshold values, to the private sector by auction or competitive bidding. The Department of Science and Technology (DST) has released a report called the ‘Critical Non-Fuel Mineral Resources for India’s Manufacturing Sector: A Vision for 2030’. It offers a first-of-its-kind framework for India to identify the 12 critical minerals (including include beryllium, germanium, rare earths (heavy and light), rhenium, tantalum, etc. ) that can play an important role in the Make in India program, and assesses the impact of these critical minerals on the manufacturing sector. It also weighs the economic importance of these minerals and associated supply risks. The critical minerals identified in the report are used in a number of industries to manufacture aerospace vehicles, automobiles, cameras, defense, entertainment systems, laptops, medical imaging, nuclear energy, and smart phones. They can also play an important role in the government’s low-carbon plans by playing an important role in manufacturing of hybrid and electric vehicles. They will be required to help the government achieve its 100GW solar target and to achieve the national domestic efficient lighting programme. These minerals also have an important role to play in the national security of India. The report recommends that in the coming years, India will have to join hands with existing global players to secure assured supply of these critical minerals to aid the manufacturing sector of India in 2030. Knowing that we need, it will be possible to identify and collaborate with global players, and to direct our R&D efforts more easily. It is to be noted that over the past year, the Government of India has made several efforts to boost the growth of the mining industry, such as speedy clearances, creation of an exploration fund, and introducing fair and transparent auctions. Allocation of mines for 50 years (instead of 30 years as stipulated earlier), and setting up of District Mineral Foundations (DMF) which are responsible for the socio-economic development of people affected by Mines are other initiatives by the government that aim to boost the mining industry of India. Soon, the government is likely to also announce the Exclusive Economic Zone Offshore Concession Rules to attract foreign investors to the sector. Currently, the mining sector contributes 2.4% to India’s GDP. Minister of Mines Piyush Goyal said that the government aims to increase it by another 1% in the next 2-3 years. Only 10% of the Obvious Geological Potential (OGP) area identified by GSI has been explored till now. Mining is taking place in only 1.5 to 2% of this area. By involving the private explorers (who will be selected through a transparent e-auction process), the government hopes to undertake detailed regional exploration. Out of 12 minerals critical for India’s manufacturing sector and national security, India is 100% dependent on import for 7 minerals. Our country does not have any declared sources for these minerals yet. Hence, it is our priority to domestically explore critical minerals, strategically acquire overseas mines, and sign trade and diplomatic agreements to cover any supply risks. We also need to promote research and development to find better substitutes of priority minerals, and scale up innovation in the recycling and metal recovery sector. Despite the high level of development, the mining sector in India has been unable to realize its potential due to outdated technology it depends on. Right now, we can only be mining to the depth of 300 meters. There are many opportunities of discovering sub-surface deposits using the latest techniques and processes available these days. The opening up of the sector for private players and foreign investment is expected to make the mining and minerals industry more competitive now. India’s numerous technology research institutes are already working on energy-related Research & Development, and there are several other aspects which need to be studied more minutely. At present, the mining industry employs more than 11 lakh people, and offer wide-ranging career opportunities – from mining engineers to unskilled labour. It offers high rate of wages, provides raw material to other industries, and contribute about 16% of India’s total exports. India is the world’s largest producer of mica, third-largest producer of coal and lignite, and is among the top producers of iron ore, bauxite, luminium and manganese. It has around 20,000 known mineral deposits and the labour is cheap here. Hence, the future of those who work in the mining sector in India is quite secure. It is estimated that in the next five years about Rs 2,116 crore will be needed to implement the National Mineral Exploration Policy (NMEP). It is expected to be funded from the regular annual budget of the GSI, Ministry of Mines and additional grants (such as funds from NMET and budgetary support by the Central Government). *1 Block each of Bauxite, Phosphate, Andalusite, Dunite, Vanadium, Barium, Glauconite, and Dolonite. In the first phase, 43 of these major mineral blocks across eight states have been notified for auction. These include 6 blocks of limestone in Andhra Pradesh; 5 blocks in Chhatisgarh including 2 of gold and 1 of gold; 14 blocks of iron ore in Karnataka; 4 blocks in Maharashtra including 1 of bauxite, 1 of iron ore, 1 of limestone, and 1 of tungsten; 3 blocks in Odisha including 2 of limestone and 1 of iron ore; and 3 blocks of limestone in Rajasthan. The new mining policy is expected to create at least 60 lakh new jobs by 2025. Each mine employs hundreds or even thousands of skilled and unskilled people. In the 50-100 km radius of a mine, local service sector jobs get boosted and it has been observed that the nutritional outcomes for the poor improve considerably. Exploration of minerals and their mining on a large scale will surely lead to creation of lakhs of jobs in mineral processing and use too. The vast potential of the mining sector cannot be ignored. Mineral and energy consumption per capita is one of the key indicators of prosperity. Till now, we have been importing basic minerals like coal and iron ore – even though we have some of their largest known reserves. The new mining and mineral policy seeks to change this scenario. Mineral exploration is an extremely high-risk venture. With the new mining policy in place, the profitability and viability will be ensured and the mining sector will be able to take off more smoothly. With the full mapping of mineral deposits done, the policy will make sure that the mining licences that are granted comply with the environmental protection requirements of the community. According to the experts, easy transferability of Mining Licences is one of the most important aspects of this policy. They believed that if the mineral exploration companies are listed in the stock market, the open market will certainly push any unethical companies out of business. The large-scale mapping of mineral resources will also encourage potential investors as it will reduce the ‘uncertainty’ involved in such ventures. This, in turn, will give a huge boost to employment in the mining sector. The new mining policy focuses on ‘exploration’ which is the first step in the lifecycle of mining and oil & gas production. Unlike China, India has the advantage of a plentiful reserve of good to medium grades of ore, which means that our ‘exports’ can improve considerably too. The infrastructural growth and development in India means that the consumption of steel and aluminium in the country is growing too.